I recently posted a summary of recent decisions on the validity of joining First Party Benefit Claims and a Bad Faith Claim against a carrier under one caption. See "Bad Faith Claim Allowed to Proceed in First Party Benefits IME Case" (6/11/2010): http://www.torttalk.com/2010/06/bad-faith-claim-allowed-to-proceed-in.html. 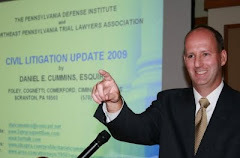 In that post, I noted that I did not have a copy of the referenced opinion by Lackawanna County Court of Common Pleas Judge Carmen D. Minora on the issue in the case of Veltri v. Travelers Commercial Insurance Company, 08-CIVIL-8534 (Lacka. Co. September 2, 2009 Minora, J.). I wanted to update that post by confirming that I have just received a copy of the Veltri Opinion should anyone need it. If so, please contact me at dancummins@comcast.net. I send thanks to the prevailing Plaintiff's attorney in Veltri, Thomas Helbig, Esquire of Scranton for forwarding a copy of the Opinion to my attention.